When the economy crashed, the United States government was blamed for failing to effectively regulate the financial sector. Two years later, may similar problems have led to the BP oil spill? Whether financial or environmental, regulation determines how much risk companies can take on. "In both cases, neither companies nor the government had a viable plan for what would happen if disaster happened, largely because they refused to take seriously the possibility of catastrophe," said Erik Gerding, associate professor, School of Law. "Both the private sector and regulators placed an almost religious faith in the capacity of engineering to deal with risk. In the case of the financial crisis, it was faith in financial engineering, like complex financial instruments and computer-based models for measuring risk. In the Gulf disaster, it was faith in petroleum engineering." Doug Brown, dean, Anderson School of Management said "the right kind of enforcement" is as important as "the right kind of regulation." He said the U.S. Mineral Management Service, which regulates offshore drilling, "got too cozy with big oil." A failure in enforcement was also to blame for Bernie Madoff's $60 billion "mirage," Brown said. Harry Markopolos, then an investment officer at Rampart Investment Management, independently investigated Madoff, discovered the investment scam and reported it to the Securities and Exchange Commission more than nine years before Madoff's arrest. "He went to the SEC saying ‘This guy is cheating, go after him,' for years and years," Brown said. Conflicts of interest between MMS agencies – as well as between regulators and industry leaders – may have derailed effective enforcement of regulations. Law Professor Denise Fort said MMS failed to properly review the BP project that led to the oil spill. "The secretary of the interior has concluded that the MMS… should be restructured, because the regulatory mission was compromised by the agency's other mission of encouraging mineral development. Major questions have been raised about the failures of the MMS to adequately scrutinize the project, failures for which the people and wildlife of the Gulf continue to pay." "The messiness comes in trying to allocate authority among different regulatory agencies," Gerding said. "Fragmented authority allows policymakers to shift blame easily, but centralized authority runs the risk of one mistake being catastrophic. The trick is to figure out if there is a natural bias towards one type of result – more oil exploration, more profits from financial markets – for example because of regulatory capture. If there is a bias, we need to build in checks and balances to level the playing field the other way." Too little government or too much? Law Professor Reed Benson attributes the cozy relationship between MMS and the oil industry – and between regulators and businesses in the financial sector – to "a prevailing view that serious government oversight of the industry was bad policy. That view was based partly on an assumption that the industry understood these technical, complex fields better than anyone else, and that the established players had the know-how and savvy to avoid doing anything stupid or rash." "Government oversight came to be viewed as simply imposing undue burdens on responsible corporate actors, at the expense of important economic interests: financial innovation and energy production," he said. "It will be interesting to see whether these two disasters lead to a shift in perception about the value of regulation." Brown said "heavy-handed" regulation is a real problem, requiring excessive paperwork that increases costs and slows productivity. He stresses that the central question isn't how much regulation there is, but how effective it is in protecting public safety. A problem he sees is the failure to discard regulations that have proven ineffective. "Regulations tend to just build and build and build and get encrusted," he said. Too much government – as well as too little – may have set the stage for the financial crisis and the oil spill. Gerding said, "The financial crisis mushroomed because the market correctly assumed the government would bail out too-big-to-fail financial institutions. The oil industry engaged in risky drilling because Congress imposed a cap on their liability." 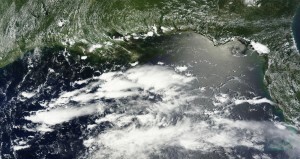 As of July 12, more than 550 miles of Gulf Coast shoreline were oiled, 31 million gallons of oiled water recovered and 10 million gallons removed through controlled burns, according to the Deepwater Horizon Incident Joint Information Center. The U.S. Fish & Wildlife Service lists more than 50 endangered or threatened species that could be impacted by the Gulf oil spill. BP recently announced that response costs have exceeded $3 billion. "The first question we all have to ask is whether we should be transitioning away from using oil because of its inherent safety and environmental risks," Fort said. "Whether oil is developed off shore, in Nigeria or in New Mexico, there are environmental hazards associated with its development and use."